Please find attached agenda for the General Meeting to be held at the Roma Administration Centre on March 7, 2012 at 9.00am. Paul Schefe on behalf of State Valuation Service will provide Council a presentation concerning the upcoming revaluation of the Council area. To be held at the Roma Administration Centre on 14 March 2012. In accordance with the provisions of section 72 of the Local Government (Operations) Regulation 2010, a local government may resolve to close a meeting to the public and move ‘into Committee’ to discuss confidential items that it’s Councillors or members consider it necessary to close the meeting. Local Government (Operations) Regulation 2010 Section 72(h) other business for which a public discussion would be likely to prejudice the interests of the local government or someone else, or enable a person to gain a financial advantage. Local Government (Operations) Regulation 2010 Section 72(e) contracts proposed to be made by it. Local Government (Operations) Regulation 2010 Section 72(f) starting or defending legal proceedings involving it. Mayor Cr. R S Loughnan chaired the meeting with, Deputy Mayor Cr. T G Hartley, Cr. J P Bartels, Cr. J L Chambers, Cr. R J Denton, Cr. W M Newman, Cr. W S Wason, Cr. J S Watson, Chief Executive Officer – Paul Bawden, Director Community Services – Tony Klein, Director Corporate Services – Matthew McGoldrick, Director Planning & Environment – Rob Hayward, Corporate Communications Officer – Jane Frith, and Kelly Rogers Minutes Officer in attendance. Jock Douglas representing Australian Land Management Group. Liz Todd representing Queensland Murray Darling Committee. The Mayor welcomed all present and declared the meeting open at 9.15am. That apologies be received and leave of absence granted for Cr. Price for this meeting. That the minutes of the General Meeting (2-15.02.12) held on 15 February 2012 be confirmed. In accordance with the Local Government Act 2009 Council is required to establish a Purchasing Policy which sets out Council’s legally compliant Purchasing and contracting principles that will be applied by all Council staff when undertaking any Purchasing. Council at length discussed the Policy. The below mentioned motion was put forward, however “no vote” was taken on the motion, with the “Mover” and “Seconder” electing to withdraw the motion. That Council adopts the revised Purchasing Policy as presented. That Council further consider the Purchasing Policy as part of a Council Workshop to be held on 29 February 2012. This report recommends to Council the write off of items that have been disclosed previously in the Financial Statements and records of Council as Inventory-Quarry Stock. That Council approve the write off of $505,513.39 of Inventory – Quarry Stock, being the difference between the stockpiles held at the quarry and the Council records. The Department of Environment and Resource Management seeks Council’s views on an Application for Conversion of Special Lease 36/44733, Lot 297 on WV1772. This land is located in Duke Street South and is used for industrial purposes. The proposed use of the land is secondary industry (Roma Industrial Estate). That Council advise the Department of Environment and Resource Management that it has no objection to the conversion of Special Lease 36/44733 over Lot 297 on WV1772 with the proposed use of the land being secondary industry and furthermore that there are no known non-indigenous cultural heritage values associated with the land. The Council has applied for a “Local Government and Ancillary Equipment Grant” through the Department of Environment and Resource Management, for a Weighbridge at the Roma refuse tip. To fully fund this project a commitment of approximately $40,000.00 is required from Council to cover the variance between the grant funding and the recommended Tenderer. Council requested the Chief Executive Officer follow up on installation of power arrangements. costing. 1) Council accepts the tender from Australian Weighing Equipment for $191,759.80 for the provision of a weighbridge at the Roma refuse tip, on the basis that grant amount of $154,604 which is specified for funding the weighbridge is received from DERM. 2) Council conditionally fund this project in the 2012/13 budget for a value of $200,000, reliant on payment of the grant by DERM. Tender 12/6 calls for the relining of 1,937 metres of sewer main, of various diameters, in the Roma Town area. The tenderer recommended for the work is Kembla Watertech, as they display the best value for money as well as having a favourable past history of work for Council. That tender 12/6 for sewer relining be awarded to Kembla Watertech, based on value for money as well as favourable previous work history with Council for the sum of $215,736.94 (GST Inc). Council will enter the caretaker period on 10 March 2012 in preparation for the 2012 quadrennial election on 28 April 2012. During the caretaker period a number of restrictions apply to Council, Councillors and Council officers. That Council adopts the Caretaker Period Protocol as presented and that the Chief Executive Officer communicates internally and externally the adopted protocol of Council. The Council will shortly be entering the Caretaker Period prior to the 2012 quadrennial elections. Due to the calendar for February including five Wednesdays and impacts of floods on general operations an additional Ordinary Meeting is proposed to be scheduled. That an additional Ordinary Meeting of Council be arranged for the 7 March 2012 to be held in Roma. Cr. Hartley and Cr Chambers declared a percieved conflict of interest in the following item due to Cr. Hartley being President of the Maranoa Diggers Race Club and Cr. Chambers the Secretary of same. N J Contracting have in the past and have indicated a future intention to sponsor Maranoa Diggers Race Club meets. Both Councillors left the Chambers at 10.24am taking no further part in debate or discussion. Council requested expressions of interest (EOI) for companies interested in providing civil construction and maintenance materials and/or services for Council’s NDRRA program. The intention of the EOI is to select respondents onto an ‘approved contractor list’ established in accordance with section 180 of the Local Government (Finance, Plans and Reporting) Regulation 2010 (Qld). The expressions of interest have been evaluated and six companies are recommended to be included on the ‘approved contractor list’. The establishment of an ‘approved contractor list’ does not prevent Council from seeking tenders for work under the NDRRA program from companies that are not on the ‘approved contractor list’. Cr. Chambers and Cr. Hartley entered the Chambers at 10.29am. Subject Heading: Short-listing of respondents to expressions of interest for annual lease of parking bays - Roma Airport, and lease of car rental booths - Roma Airport. Two related expressions of interest were recently called in respect of the major upgrade to Roma Airport. The expressions of interest were in respect to the annual lease of car parking bays at Roma Airport (Car Rental Bays) and lease of commercial booths in the Terminal Building at Roma Airport to provide car rental services (Car Rental Booths). Responses to the expressions of interest have been evaluated. The next stage of the process is to invite tenders from a short-list of respondents. 3. That Council authorise the Chief Executive Officer to negotiate with the preferred tenderers for the Car Rental Booths and preferred tenderers for the Car Rental Bays, and to enter into contracts in respect of the Car Rental Booths and the Annual Lease. Jock Douglas on behalf of Australian Land Management Group and Liz Todd of Queensland Murray Darling Committee provided Council an overview of a proposed program designed to establish the Maranoa Region as leading the way in Australian land management. Council’s support of the program was also sought. Council agreed to further discuss the request at the next Council Workshop scheduled for 29 February 2012. That Council close the meeting to the public at 11.52am. Cr. Bartels declared a perceived conflict of interest for the confidential report “Roma Airport Accommodation Village,” due to him owning an accommodation facility in Roma and left the Chambers at 1.36pm taking no further part in closed discussions on the matter. Closed discussion on the Roma Airport Accommodation report ceased and Cr. Bartels entered the Chambers at 2.13pm. That Council open the meeting to the public at 2.39pm. Cr. Chambers declared a conflict of interest in the following item due to her being a member of the Mungallala Rural Fire Brigade and left the Chambers at 2.40pm taking no further part in discussions or debate. Correspondence has been received from Paul Storrs requesting that the vacant water and sewerage charges on the rates for the Mungallala Rural Fire Brigade be waived as it is run by volunteers and being a small community the Brigade have limited fund raising opportunities. That Council waives the vacant water and sewerage charges on the property owned by State of Queensland (Rate Notice paid by Mungallala Rural Fire Brigade) as it is run by volunteers, has limited fundraising opportunities and is a vital service to the surrounding small communities. That Council make representation via LGAQ to approach the Queensland Government to seek that the State of Queensland meet rate payments for properties that are operated for emergency service purposes by volunteers. Cr. Chambers entered the Chambers at 2.42pm. Ms Shipley has made a request for the reduction of the discount amount and interest charged on the unpaid rates for the property identified on rates assessment number - 11009867. That Council resolves not to allow a reduction of the discount and interest. Ratepayer has requested that interest stop accruing on overdue rates and charges for rates assessment number – 15001142. That Council at this stage denies the request for interest to stop accruing on the overdue rates, and that Ms Reinke be advised that if she enters into an instalment arrangement, interest on the outstanding balance will cease. Cr. Bartels declared a perceived conflict of interest in the following item due to him owning an accommodation facility in Roma and left the Chambers at 2.50pm, taking no further part in discussions or debate. On the 14th of December 2011 at its general meeting, Council resolved to go to open tender to identify a developer with which to negotiate a contract based on the abovementioned criteria. This report delivers the outputs of the tender process and makes recommendations for further actions which will deliver this project to the community. 2. Council authorises the Chief Executive Officer to negotiate and sign a contract with the preferred contractor that will deliver the goals of the project to the community. Cr. Bartels entered the Chambers at 2.52pm. As part of the flood recovery community groups/organisations have taken a lead in managing both monetary and in-kind donations. Following the initial establishment of a centre in an industrial building, larger premises were sought. There was some support at the councillor level in identifying larger premises. This led to the former Roma Motors site on Bowen Street, Roma being made available. Subsequently the power was connected by Ergon and some tidying of the property provided informally by Council Officers. Through a range of meetings a number of matters have been progressed, while an additional request has been raised as to support for waste disposal. That the report on support for community initiative be received and noted. That Council authorise the Chief Executive Officer to further negotiate waste disposal arrangements from the site with operators of the donation centre. Tenders were called for the supply, installation & commissioning of security screening equipment at the Roma Airport to comply with the requirements of the Office of Transport Security. That Council authorises the commencement of design and tendering for the amended conveyor belt system to enable the security screening to be commissioned. There being no further business, the Mayor thanked Council for their attendance and declared the meeting closed at 3.02pm. These Minutes are to be confirmed at the next General Meeting of Council to be held on 7 March 2012, at Roma Administration Centre. Following feedback from employees and management a set of guidelines has been developed to assist in the management of Annual Leave whilst giving the flexibility desired. 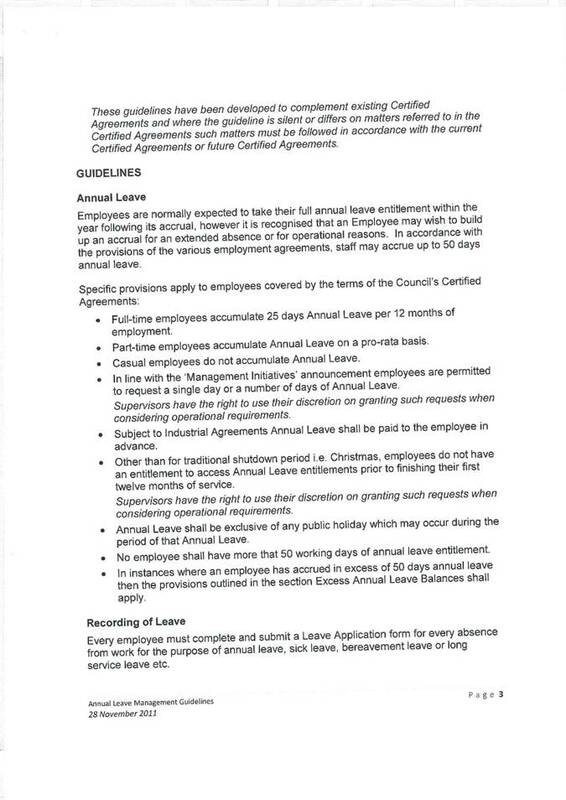 The proposed changes require amendments to Council’s current Annual Leave Policy. 2. That the CEO communicates the revised Annual Leave Policy to the workforce. 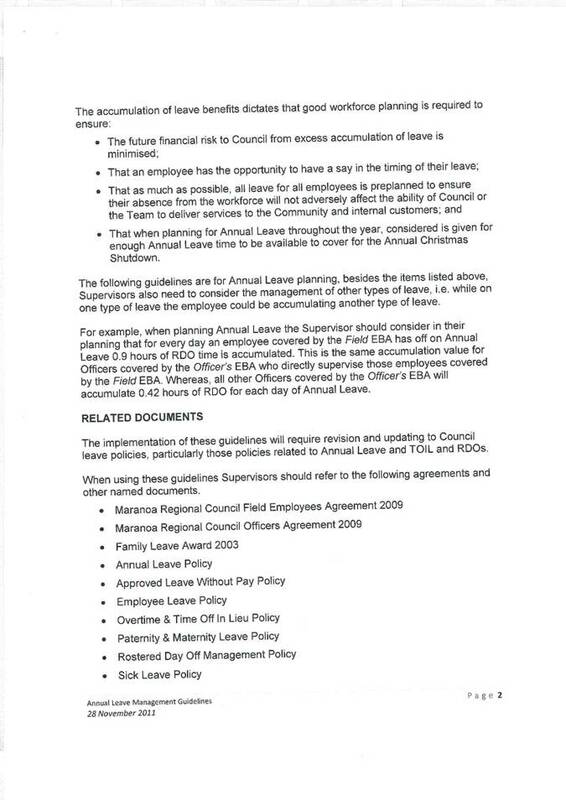 Council’s current EBAs, on an annual basis, allow provision for 25 days of Annual Leave. Recent feedback from employees indicated a desire for greater flexible access to their annual leave. In September 2011the CEO addressed a letter to all employees to open up communication on items and issues that would improved the way Council conducts its business and retains current staff. Feedback received created a discussion paper to centralise ideas from Council’s workforce on the retention of staff – this included flexible annual leave arrangements. The feedback in the discussion paper on flexible annual leave provided a basis for a draft set of guidelines to outline rules to assist in granting greater leave flexibility. The guidelines also addressed Council’s need to maintain an available workforce to deliver services to the Community and internal customers. Through Department (Senior) Managers, feedback on the draft Annual Leave Guidelines was sought from Council’s workforce. From all feedback received and discussion at a managerial level the attached Annual Leave Management Guidelines was released. 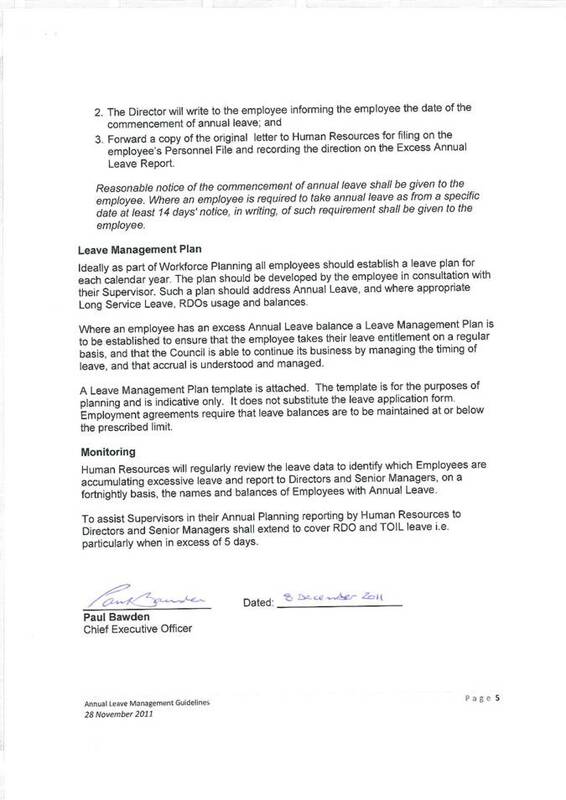 The Annual Leave Management Guidelines recognise that Maranoa Regional Council’s leave liability has to be effectively managed to ensure that employees have a reasonable period of rest and recreation. The guidelines also recognise that it is also equally important to manage all forms of leave in terms of the organisation’s current and future financial liabilities. In particular the guidelines recognise that good workforce planning is essential to ensure that leave flexibility is a deliverable initiative that does not negatively impacts on Council’s service delivery or financial exposure. The guidelines have necessitated a revision of Council’s Annual Leave Policy. The additional changes are highlighted in the attached draft Annual Leave Policy. The previous provision requiring a minimum stock of five days annual leave has been removed and gives Council’s employees the flexibility requested and through workforce planning manages Council’s service delivery requirements and financial exposure. Feedback from employees in response to Paul Bawden’s letter to employees inviting ideas on improving Council as a better place to work. Discussion and input from Directors and Senior Managers. Requires amendments to Council’s adopted Annual Leave Policy. Corporate Plan 2009-2013 — 8.1.2(a) To provide and develop contemporary and professional human resource practices and functions in an environment that promotes Equal Employment Opportunity principles and recognises all employees in a fair and respectful manner. The purpose of this policy is to clearly outline the way in which employees’ annual leave entitlements are managed in order to both ensure that employees take their annual leave regularly each year to ensure Council’s annual leave liability is minimised. This policy applies to all current and future Maranoa Regional Council employees. means Annual Leave hours that has accumulated over time in accordance with the provisions of the employment instrument. means the amount of leave available to a staff member, that being the difference between the leave entitlement granted to an individual and leave taken by that individual. means the head of the Department in which an Employee is working. Also known as a Senior Manager. means the head of the Directorate in which an Employee is working. means Enterprise Bargaining Agreement an agreement certified in the Queensland Industrial Relations Commission. means an established right granted in accordance with the provisions of the employment instrument. means an additional payment employees receive when taking paid annual leave. Under current legislation annual leave loading is calculated at 17.5% on the ordinary time rate of pay. means a negotiated Leave Management Plan between the employee and their Supervisor. means the set of basic principles and associated guidelines, formulated and enforced by the governing body of an organisation, to direct and limit its actions in pursuit of long-term goals. The process of managing leave is the responsibility of Senior Managers. Supervisors will consult with their staff to ensure, where possible, leave accruals are taken at a mutually convenient time and the operations of the areas are not adversely affected. Council grants employees generous leave provisions particularly when compared to many organisations within the Private Sector. · All fulltime employees covered by an EBA will accrue five (5) weeks annual leave per year of service. · All part-time employees covered by an EBA will accrue annual leave on a pro-rata basis based on five (5) weeks annual leave accrual per year of service. · Casual employees are not entitled to paid annual leave. · All other employees not covered by an appropriate EBA will accrue annual leave in accordance with the relevant Awards and/or Contract of Employment. • That when planning for Annual Leave throughout the year, considered is given for enough Annual Leave time to be available to cover for the Annual Christmas Shutdown. The following procedures are to be followed for the purpose of Annual Leave planning. When planning Annual Leave, Supervisors also need to consider the management of other types of leave, i.e. while on one type of leave the employee could be accumulating another type of leave. For example, when planning Annual Leave the Supervisor should consider in their planning that for every day an employee covered by the Field EBA has off on Annual Leave 0.9 hours of RDO time is accumulated. This is the same accumulation value for Officers covered by the Officer’s EBA who directly supervise those employees covered by the Field EBA. Whereas, all other Officers covered by the Officer’s EBA will accumulate 0.42 hours of RDO for each day of Annual Leave. Ideally as part of Workforce Planning all employees should establish a leave plan for each calendar year. The plan should be developed by the employee in consultation with their Supervisor. Such a plan should address Annual Leave, and where appropriate Long Service Leave, RDOs usage and balances. Where an employee has an excess Annual Leave balance a Leave Management Plan is to be established to ensure that the employee takes their leave entitlement on a regular basis, and that the Council is able to continue its business by managing the timing of leave, and that accrual is understood and managed. 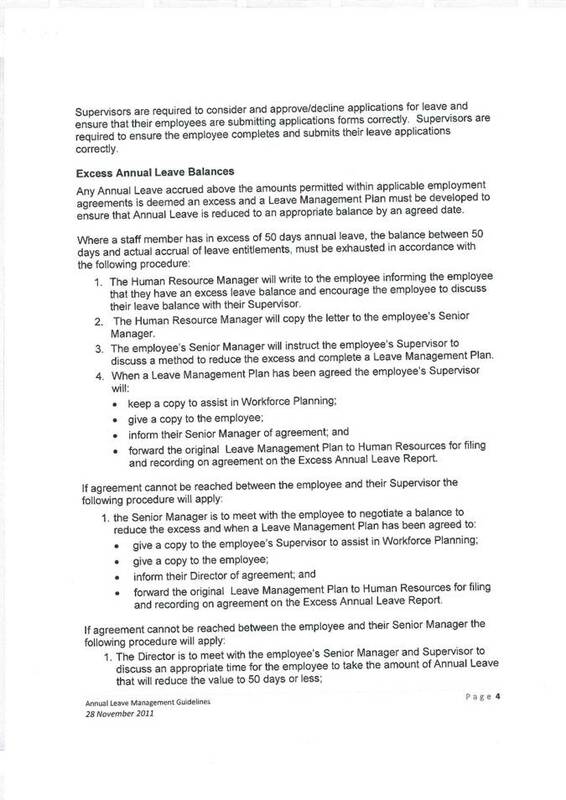 A Leave Management Plan template is attached. The template is for the purposes of planning and is indicative only. It does not substitute the leave application form. Employment agreements require that leave balances are to be maintained at or below the prescribed limit. Council may decide to shutdown one or more sections of Council’s offices, teams, business units and/or sections for a given number of days over the December/January Christmas period. It is the Supervisors’ responsibility to ensure their staff maintain sufficient leave for the Annual Council Christmas Shutdown. Every employee must complete and submit a Leave Application form for every absence from work for the purpose of annual leave, sick leave, bereavement leave or long service leave etc. 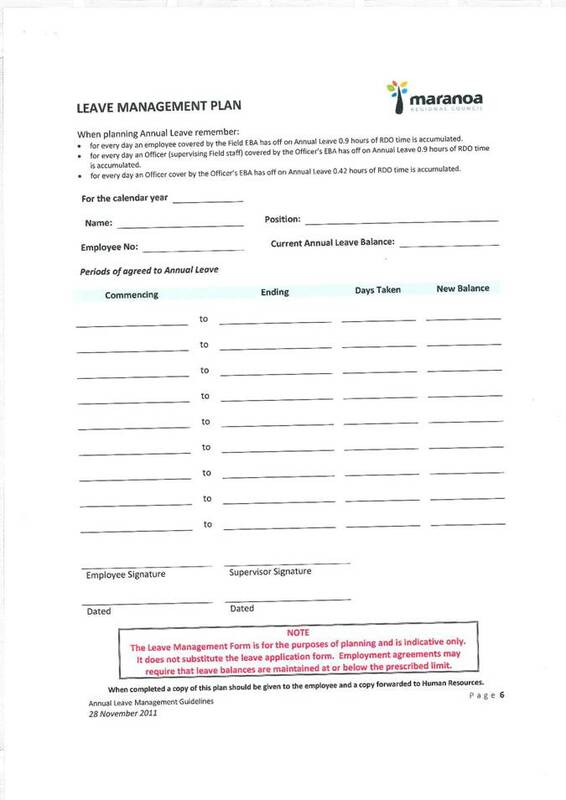 Supervisors are required to consider and approve/decline applications for leave and ensure that their employees are submitting applications forms correctly. Supervisors are required to ensure the employee completes and submits their leave applications correctly. Any Annual Leave accrued above the amounts permitted within applicable employment agreements is deemed an excess and a Leave Management Plan must be developed to ensure that Annual Leave is reduced to an appropriate balance by an agreed date. 1. The Human Resource Manager will write to the employee informing the employee that they have an excess leave balance and encourage the employee to discuss their leave balance with their Supervisor. 2. The Human Resource Manager will copy the letter to the employee’s Senior Manager. 3. The employee’s Senior Manager will instruct the employee’s Supervisor to discuss a method to reduce the excess and complete a Leave Management Plan. • forward the original Leave Management Plan to Human Resources for filing and recording on agreement on the Excess Annual Leave Report. 3. Forward a copy of the original letter to Human Resources for filing on the employee’s Personnel File and recording the direction on the Excess Annual Leave Report. Reasonable notice of the commencement of annual leave shall be given to the employee. Where an employee is required to take annual leave as from a specific date at least 14 days' notice, in writing, of such requirement shall be given to the employee. Human Resources will regularly review the leave data to identify which Employees are accumulating excessive leave and report to Directors and Senior Managers, on a fortnightly basis, the names and balances of Employees with Annual Leave. An employee can terminate their employment whilst on annual leave. Such resignations must be in writing and addressed to the CEO. The initial notification of termination may be given by the CEO whilst the employee is on annual leave, however, the notice will not commence until the employee returns to work after the conclusion of annual leave. In a situation where notice has been given and this notice extends into an annual leave period the notice will cease while the employee is on annual leave and recommence when the annual leave concludes. This Policy is available through Human Resources and the Council’s Policies website. This policy, after adoption by Council, will be presented at a Senior Managers Meeting for communication and distribution by Senior Managers to all staff in their area/s of responsibility. This policy can be varied by the Chief Executive Officer if exceptional circumstances prevail. This policy must be reviewed at 2 years months since its adoption (or latest amendment). The Annual Leave Management Guidelines that were developed from employee feedback and as released on the 28th of November 2011 will form part of this policy. This policy complements other legislation and where it is silent on matters referred to in the following legislation such matters must be followed in accordance with the legislation. This policy complements existing Certified Agreements and where it is silent on matters referred to in the Certified Agreements such matters must be followed in accordance with current Certified Agreements or future Certified Agreements. This policy should read in conjunction with the following Council Policies. Council are required to prepare an Annual Report by the 30th November each year. This year Council requested and were granted an extension on the preparation of the Annual Report until the 31st January, 2012. A further extension was requested in order to meet the requirements of audit. That the Annual Report for the year ended 30th June 2011 as presented be adopted and be approved for publication. Council’s Annual Financial Statements have been re-signed by the Mayor and CEO and submitted to the Queensland Audit Office for signing by the Auditor General. These Statements are included in the Annual Report along with a Community Financial Report, other Statutory reporting requirements and other information about the performance of Council. An Annual Report in Electronic form will be forwarded to all Councillors. The final report will also be loaded onto Council’s web site. A presentation of this report can be made should Councillors so desire. Nil, Council needs to document and publish the financial and organisational performance for the prior year. Corporate Plan 2009-2013 — 8.2.1(a) To instil confidence to Council and other stakeholders in their decision making by developing and implementing financial procedures, processes and methodologies in an environment that promotes integrity and accountability. Council prepared draft Financial Statements for the year ended 30th June 2011 and presented these Statements for audit on the 15th September, 2011. The audit of these Statements is now complete. The audited statements have been qualified by the Auditors and there have been some changes to the Draft Statements that have arisen due to new information or due to a request for a change in accounting treatment by audit. The audit opinion and the variances between the draft and final statements will be highlighted in this report. That the changes to the Draft Financial statements are noted and that Council recognises the qualification issued by the Auditors but submits that limited resources do not permit Council to be able to carry out a proper asset impairment assessment at this stage and as a consequence Council would have had a lack of confidence in the completeness and accuracy of any impairment assessment of Council’s assets. Variance : $14,108,687 this variance is due to incorrect accounting for grants and subsidies received and billed at the 30th June, 2011 wherein grants received were also accounted for as billed and not yet received. The final amount has been corrected for this overstatement. Variance : $406,456,031 this variance is due to the asset valuation data not being available for the Draft accounts but being ready, included and accounted for in the final statements. The increase in asset revaluation surplus is due mainly to an increase in the fair value of the Roads Infratsructure. Variance : $2,439,151 this variance is due to incorrect accounting treatment of receipts for cash grants received as at 30th June. The final Cash balance is amended for the error. Variance : $11,667,091 this variance is due to incorrect accounting treatment of receipts for cash grants received as at 30th June. The final Receivables balance is amended for the error. Variance : $405,575,664 this variance is due to asset revaluations being applied to Council’s assets and the value of the assets on the Balance Sheet being reflected at this new value. Variance : $406,456,031 this variance is due to asset revaluations being applied to Council’s assets and the value of the assets on the Balance Sheet being reflected at this new value. Variance : $39,137,433 this variance is due to a change to the revenue accounted for in the draft statements as unconstrained to constrained in the final statements. Variance : $22,195,347 this variance is due to a change to the revenue accounted for in the draft statements as unconstrained to constrained in the final statements. There are other smaller variances in the statements that are much less than the variances documented above. These smaller adjustments do not have the material affect that the changes above have had on the statements. 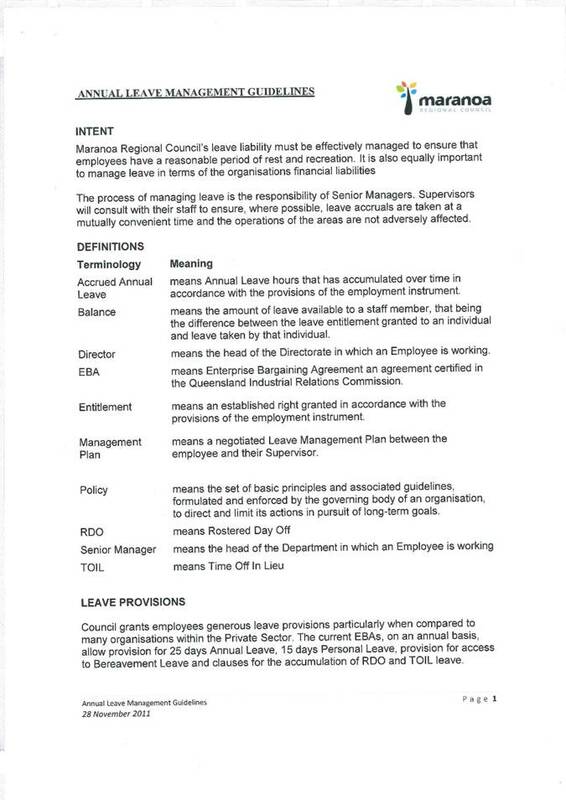 At the time of writing this report the Queensland Audit Office had indicated that they will issue a Qualification on Council’s Financial Statements. This qualification is issued because Council did not devalue or write off (impair)the assets that were impacted as part of the 2010 and 2011 flood events and also did not restore the values of the repaired assets on the Balance Sheet. As stated in the recommendation above Council did not have the resources to be able to carry this process out adequately and accurately. Significant internal changes would be required to be able to impair assets correctly and restore to the asset register those assets that are repaired as they are repaired. The risk to Council is that the value of Council’s assets are inflated. There are no known consequences of this over statement other than the over statement of depreciation and the treatment of prepaid revenue as revenue of the current year. Resources could be diverted to this activity however that would take away limited Council resources for many core activities. At a recent Councillor Workshop the role of the Energy Sector Coordinator was discussed and agreed and was seen as a critical role in facilitating a rapid and strong response to the increased energy sector activities. This report informs Council as to the progress in managing our energy sector responsibilities. For the information of Council. Councillors would be well cognizant of the increasing affects of the energy sector in general and more specifically relating to Council’s roads infrastructure. There currently exist significant demands in terms of time on Council Officers to review design parameters, negotiate infrastructure agreements, and ensure value for money as it relates to road maintenance and or construction activities arising from the energy sector. These demands compete for time against a backdrop of flood recovery works and many other normal Council activities, including cultural change aspects. Without a dedicated resource to facilitate the demands of the energy sector more stress would be placed on existing limited resources, and consequently Council would not be able to provide the efficient and professional service it would expect to provide the energy sector, or any other of our clients. The Energy Sector Coordinator role is to be funded from the energy sector itself and reports directly to the Director of Infrastructure. Risk Assessment (Legal, Financial, Political etc. ): This position will assist in addressing a number of risks faced by Council including financial risk in terms of future road maintenance costs; social risk in terms of inadequately addressing our community’s needs through the provision of a safe road network; and political risk. Policy will be required to determine how best to adequately ensure financial resources are appropriate for the impacts and services rendered.